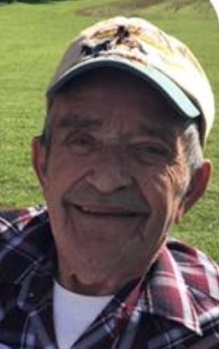 Thomas Marshall Miller, Sr., 80, of Taneytown, Maryland, died on Saturday, November 24, 2018 at the York Hospital in York, Pennsylvania. Born on October 29, 1938 in Ellicott City, Maryland, he was the son of the late John Robert and Jesse Mae (Good) Miller. Twice married he was predeceased by his first wife, Joann M. Miller in 1998 and is survived by his second wife, Bonnie G. (Barnett) Miller. Tom or “Poppy” as he was known and loved by his grandchildren and great-grandchildren enjoyed hunting, his classic car collection, attending classic car shows, showing off his animals, and horse racing. He will be missed by all who knew and loved him. “Shorty” retired as a union painter and was well known for his excellent work ethic. Surviving in addition to his wife are children, Thomas Miller, Jr. and wife Nancy of Taneytown, Robert Miller and wife Kelly of Hanover, PA, Nina Ebaugh and husband Phil of Fairfield, PA, Barbara Hiner and husband Jay of Taneytown and Michael Miller and wife Bonnie of Taneytown; 16 grandchildren; 38 great-grandchildren; sisters, Mary Harrison of OK and Jenny Williams of TN; brothers, Frank Miller of TN, Norman Miller of OK and Kenny Miller of Ellicott City; and many nieces and nephews. He was predeceased by an infant daughter, Brenda Diane Miller; and by siblings, John R. “Bobby” Miller, Jr., Jesse “Tut” Williams, Monroe, George, Stanley, Charles, Authur “Eddie”, and Leonard Miller, and Betty “Boopie” Taylor. There will be a private family viewing at the MYERS-DURBORAW FUNERAL HOME in Taneytown. Entombment and graveside service will be held at a later date in Evergreen Memorial Gardens in Finksburg, MD. Memorial contributions may be made to the Carroll County Humane Society, Adopt-a-pet, or Animal Rescue Shelter of your choice.